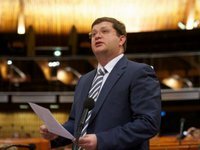 Ukraine's delegation to the Parliamentary Assembly of the Council of Europe (PACE) has called on Council of Europe Secretary General Thorbjørn Jagland and PACE President Liliane Maury Pasquier to use all mechanisms possible to defend the rights of the indigenous population of Crimea and demanded an end to attempts to restore Russia's PACE delegation mandate. The appeal came a day after about 20 Crimean Tatars were arrested by Russia-occupation forces on the peninsula. "We ask leaders of the Council of Europe to use all means and mechanisms at their disposal to defend the rights of the indigenous population of the peninsula and demand an end to all attempts to unconditionally restore Russia's delegation to PACE because of continuing violations by Russia of rule of law and human rights, which, first and foremost, must be defended by the Council of Europe, according to its charter," Member of Ukraine's Parliament (Bloc of Petro Poroshenko – BPP) and Ukraine's PACE delegation chairman Volodymyr Ariev said on Facebook on Thursday. A similar appeal from Ukraine's PACE delegation was sent to Council of Europe Commissioner for Human Rights Dunja Mijatović.